Coil lines take enormous rolls (or coils) of precisely created metal and create smaller sheets and cut sections from the master coil. Sometimes these lines provide appearance treatments, and quality modifications for the metal. They process Coil Material of varying widths, as well as punch, notch, shear, slit, bead, rollform, endform, blank, and bend various materials and products. These produce products that all of us use on a daily basis, whether we know it or not. 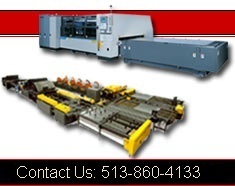 Everything from highway rails, to HVAC components, to automotive components and possibly some of our kitchen appliances were produced using sheet metal coil slitting lines, cut to length lines, or punch press lines.